White men in dark suits stand and fall silent when a black woman enters hearing room No. 3 of the U.S. District Court in San Juan. Federal judge Laura Taylor Swain greets them in Spanish, and the hearing begins, in English. This August 9 session is the third since May, when the government of Puerto Rico began an attempt to restructure its $74.8 billion in bond debt. A fiscal control board appointed by the U.S. government initiated the process, similar to bankruptcy, under Title III of the 2016 Puerto Rico Oversight, Management and Economic Stability Act (aka Promesa), signed by President Barack Obama. Because of its unique colonial history, the U.S. territory may not officially declare bankruptcy and is required to service its debt above all else. The very existence of Puerto Rico as we know it may be at stake. None of the more than 100 lawyers in the hearing room directly represent the so-called “individual bondholders,” rookie investors who bought bonds through brokerages. Instead, they represent specialized investors, such as mutual fund companies, insurance companies and hedge funds with experts in debt collection. With hundreds of millions on the line, the lawyers jockey for rank. “I’m from Queens and I remember that when you don’t pay, there are consequences,” says Susheel Kirpalani, attorney for a coalition of investment firms. Seven hours after the hearing begins, a black SUV with a sliding door and darkened windows shuttles groups back to the airport and hotels. A month later, Hurricanes Irma and Maria devastate the island. 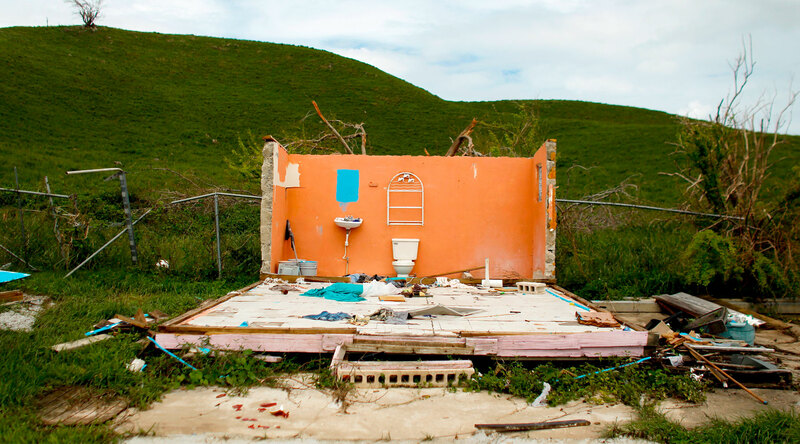 Judge Swain cancels an October 4 hearing citing a “humanitarian crisis.” With hurricane damage estimated at $45 billion to $95 billion, market analysts say debt repayment is unrealistic. Throughout both storms, the financial firms continue filing motions remotely in the court’s digital docket. A public list of Puerto Rico’s debtholders does not exist. Since 2014, the Government Development Bank of Puerto Rico, which issued the bonds, has denied requests for their identities—including one from a governor-appointed oversight commission—citing trade secrets and privacy. For five months, In These Times and Centro de Periodismo Investigativo (CPI) have been working together to track down those identities. Our first set of findings was released October 17. Of the more than 30 known financial firms vying for Puerto Rico’s debt, at least 24 are hedge funds known as vulture firms, which specialize in risky assets and cater to wealthy investors. This activity continues the century-long cycle in which outside investors extract profit from Puerto Rico and send it off the island, aided by Puerto Rico’s colonial status and special tax breaks. 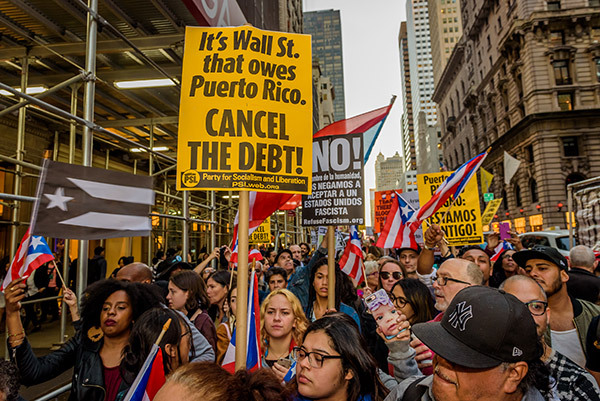 The vulture firms and mutual fund companies involved knew the island was wildly overcommitted, but they trusted the power of their outsize legal and lobbying efforts to squeeze out payments, no matter the cost to Puerto Ricans. As firms battle in court, they smell fresh opportunities after the storms. Even before the hurricanes, it appeared unlikely that Puerto Rico could pay up. In 2015, then-Gov. 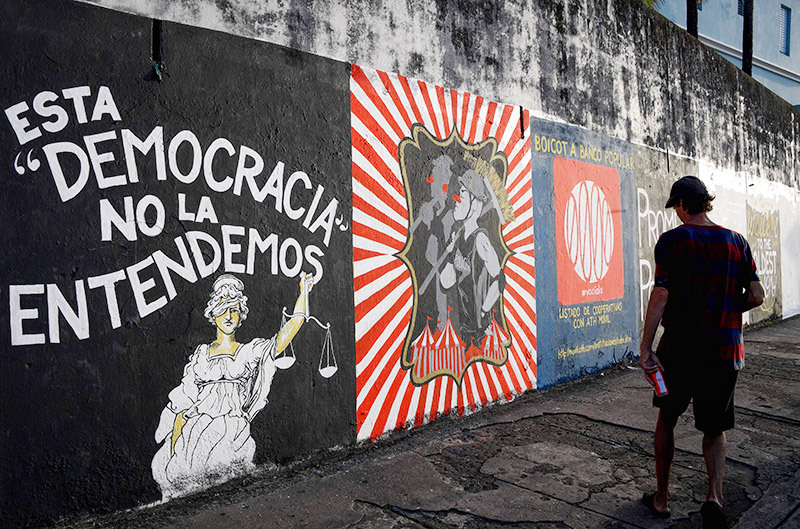 García Padilla warned the debt was “not payable.” The current governor, Ricardo Rosselló, projected this summer that the island might run out of money in November, despite austerity measures and massive school closures. To understand how the island fell so deeply into debt, one must follow a century of colonialism, cronyism and finance capitalism. Soon after Puerto Ricans became U.S. citizens in 1917, the United States imposed high shipping costs that hobbled the island’s economy. Congress then spurred outside investment by turning the island into a U.S. tax haven, luring in manufacturing and pharmaceutical companies. The boom did provide middle-class jobs, but it never created an ownership class. Assets and profits flowed away. With that exemption gone, Puerto Rico’s government turned to a special tax break that remained in place from the 1917 Jones-Shafroth Act. As a U.S. commonwealth, Puerto Rico can issue bonds that are “triple tax-free”—exempt from taxation by Puerto Rico, the U.S. government, and any U.S. state or municipality. With the economy stagnating, Puerto Rico increasingly sold these bonds to pay for infrastructure projects. “Friends” of Puerto Rico’s current administration often got first dibs, and many of the projects were white elephants, unlikely to ever raise enough revenue to compensate their backers. One infamous example is the Trump International Golf Club Puerto Rico. Puerto Rico’s Government Development Bank granted developers $25 million in the early 2000s to build a golf course and hotel. The golf course struggled to pay its debt, and the government reissued $26 million in bonds after Donald Trump agreed to license his name to the project in 2008. The owners declared Chapter 11 bankruptcy in 2015 and never paid back the loan. 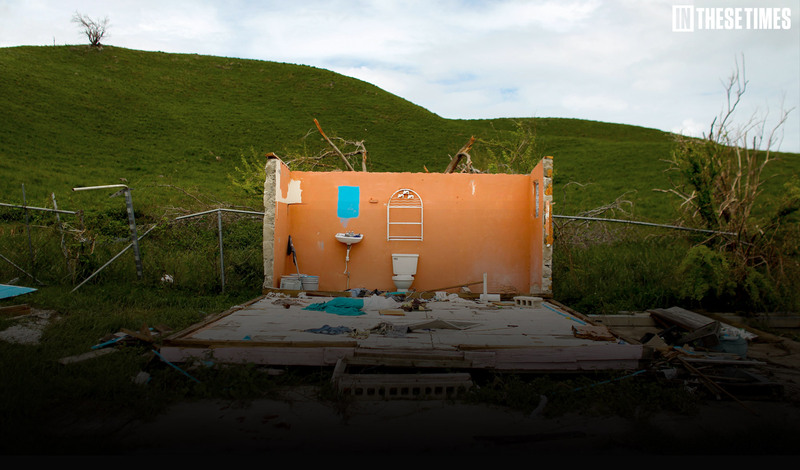 In 2006, these practices caught up with the Puerto Rican government. The island ran out of money and shut down for two weeks, furloughing 95,762 employees and temporarily shuttering 1,600 public schools. 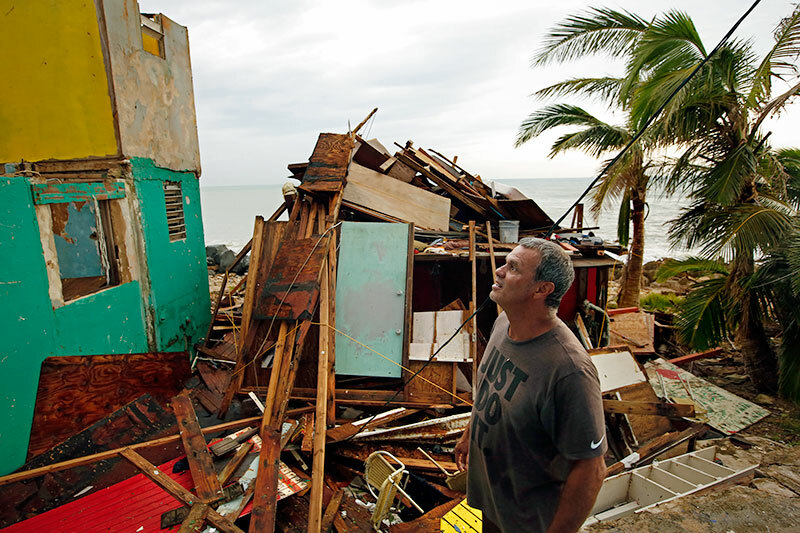 With the 2008 global financial collapse, Puerto Rico’s economy went into a tailspin. Ten percent of its population emigrated between 2006 and 2016. Today, 46 percent of the population lives below the federal poverty line (compared to a national average of 14.7 percent) with a 40 percent labor force participation rate. “There is a whole generation that knows that we are not going to live the life that our parents lived,” says Verónica Rivera Torres, who convened a gathering of Puerto Rican women in a public park in San Juan in September 2015 to discuss the toll of austerity. “There are no retirement plans, the rights of public employees are precarious, there is no work. Even as Puerto Rico was racking up enormous debt, financial firms were hoovering up its bond offerings and clamoring for more. A number of the bonds were what Saqib Bhatti, co-author of a 2016 report from the ReFund America Project on Puerto Rico’s debt, describes as “the municipal version of a payday loan,” with astronomical interest rates. About half of Puerto Rico’s current debt is deferred interest on these loans. Meanwhile, Goldman Sachs, Citigroup and other Wall Street firms have raked in more than $1.6 billion in fees to structure the deals. 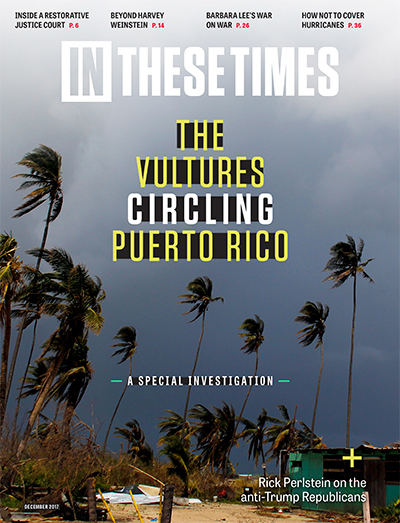 For the last five months, In These Times and Centro de Periodismo Investigativo, Puerto Rico (CPI), have been digging into Puerto Rico's debt crisis, working to uncover the vulture firms trying to squeeze the territory dry. On October 18, ITT executive editor Jessica Stites and the CPI's Carla Minet appeared on Democracy Now! with Amy Good to discuss the findings. 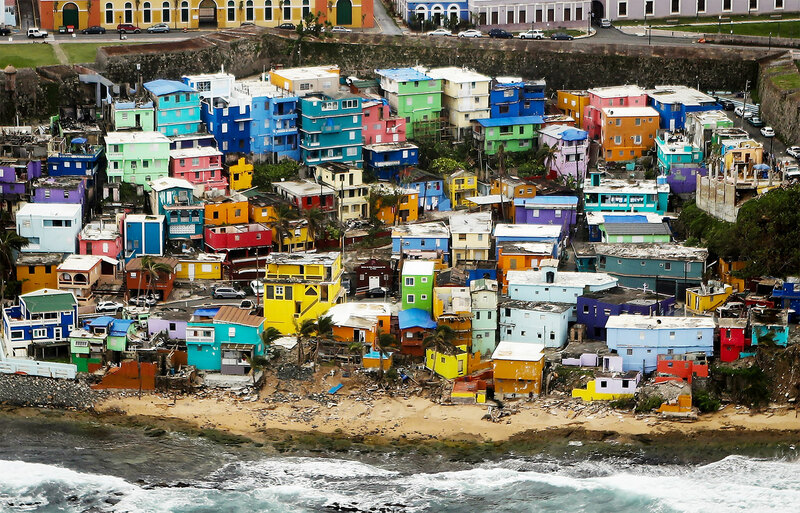 As Puerto Rico’s debt grew riskier, vulture funds grew more interested. “There is tremendous demand [for Puerto Rican bonds],” one market analyst told the New York Times after Standard & Poor’s downgraded Puerto Rico’s bonds to junk status in February 2014. The Times noted that hedge funds “see ways of protecting themselves” in case “Puerto Rico’s other debt will have to be restructured at some point.” That protection entailed an army of lawyers and lobbyists who banked on several peculiarities of Puerto Rico’s colonial status: its inability to declare bankruptcy and a clause in its constitution, from 1952, stipulating that the country must honor debt from general obligation bonds before paying any other expenses. The strategy has been effective. The Puerto Rican government passed a bill to restructure its debt in 2014, but two mutual fund companies, Oppenheimer Funds and Franklin Templeton Investments, sued and a federal court declared the bill unconstitutional. Now, thanks to Promesa, the firms are deploying their legal might in court to ensure that, should there be a haircut on Puerto Rico’s debt, they get paid first. The claims made in court amount to only about $17 billion of the total $74.8 billion the island owes. The identities of many of Puerto Rico’s other debtholders remain unknown. On August 30, the government published an official 15,000-page list containing the names of “potential creditors,” although it does not identify bondholders. Some on the list may be government suppliers and contractors, for example, or an individual investor in a mutual fund. A review of records of the nation’s two largest finance regulatory bodies—the Securities and Exchange Commission and the industry’s self-regulator, the Financial Industry Regulatory Authority (FINRA)—reveals that several of the largest mutual fund companies involved in Puerto Rico’s debt have a long paper trail of illegal behavior. Oppenheimer, Santander and UBS, which collectively claim more than $6.7 billion in Puerto Rico’s Promesa case, have paid more than $450 million in fines for fraud and rules violations since 2011. More than $85 million of those fines relate to the sale of Puerto Rican bonds. Jonathan Westin of New York Communities for Change discusses why Puerto Rico’s debt needs to be canceled. Entities from Congress to Judge Swain have different levels of power to restructure the debt. President Donald Trump pledged on October 3 to “wipe it out,” but his budget director quickly reversed course. (Trump made an odd reference to Goldman Sachs, which bought $120 million in bonds in 2014—and whose executives populate Trump’s administration—but has not officially filed a claim.) Others are calling for the United States to buy out the debt or for an equitable restructuring. Without significant change, we should expect more of the same: austerity measures to muster the funds to service that debt, and tax incentives to attract outside investors, cronies first. One contract to rebuild Puerto Rico has already caused controversy. Whitefish Energy in Whitefish, Mont., won a $300 million bid September 26 to rebuild the energy grid. The two-year-old firm has two full-time employees. Its primary backer is HBC Investments, a private equity firm run by Joe Colonnetta, a major Trump donor. As recently as 2012, Puerto Rico passed tax breaks aimed at luring wealthy investors and hedge fund managers to move to the island. “Spend six months of the year on an island with beautiful beaches and sunshine [and] you could come away not only with a tan, but with almost 100 percent of your income still in your pocket,” the Cayman Financial Review noted. 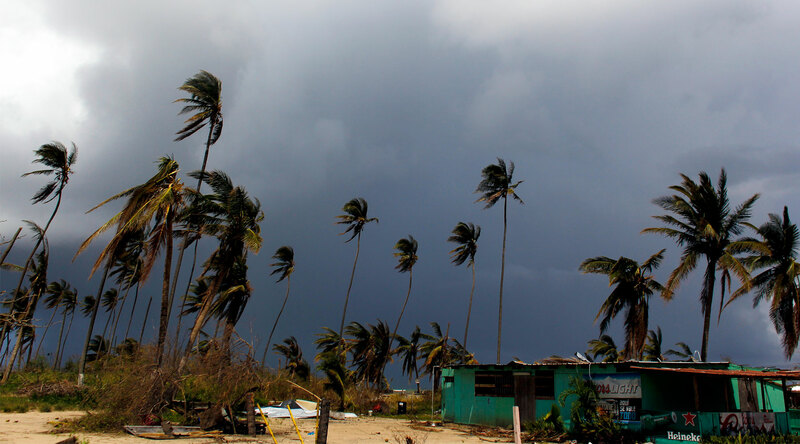 Meanwhile, in the aftermath of the storms, the Center for Puerto Rican Studies estimates that 14 percent of Puerto Rico’s population will leave within a year. A public list of Puerto Rico’s debtholders does not exist. For five months, In These Times and Centro de Periodismo Investigativo (CPI) have been working together to track down those identities. The amounts listed below are based on court documents available as of November 8. These bonds are frequently traded and the bondholders continue to file updated motions in court. The bondholders in this category have not disclosed enough information publicly to be identified as either mutual fund companies, hedge funds, vulture funds, family trusts, or investment advisors. However, Fideicomiso Plaza and José F. Rodríguez Perelló appear to be investment advisors or managers. CARLA MINET is a journalist and editor at CPI whose work has appeared on Channel 6, Radio Universidad, El Nuevo Día, the New York Times, the Washington Post, Univision and Noticel. JOEL CINTRÓN ARBASETTI is a journalist at CPI whose work has appeared in Diálogo, Cruce magazine and 80grados.net. The Centro de Periodismo Investigativo (CPI) is a nonprofit organization that promotes investigative journalism and works for freedom of information in Puerto Rico. The Leonard C. Goodman Institute for Investigative Reporting provided support for this story. Laura Moscoso and Ethan Corey contributed research and fact-checking.